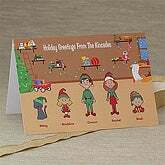 Each year, Americans send millions of cards during the holiday season, and most of them are traditional folded greetings or flat photo cards with faces of smiling families. Want to break out of the mold this year? Here are some unusual Christmas cards that pop up, play music, fold out, simply look a little different, or can even double as Christmas tree ornaments or Christmas letters. 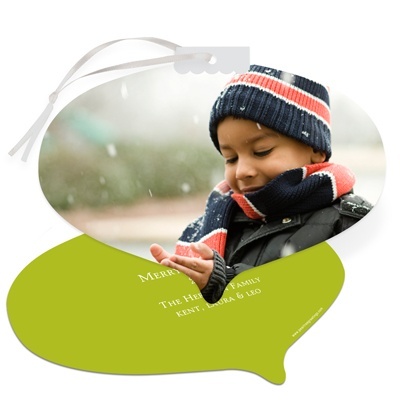 Pear Tree Greetings has some of the most unusual Christmas cards available online, including a selection of tri-fold cards,ornament cards, and cards that can double as a quick Christmas letter or even a tree ornament. What’s really nice about Pear Tree Greetings is that all of their folded holiday greeting cards are printed on 100% recycled card stock. They also have a special recycled card section that contains eco-friendly designs and also included recycled envelopes with the cards. Here’s another great unusual Christmas card – it’s a card and a calendar! While most cards are likelty to end up in the trash after the holidays, this handy tri-fold card one can be kept and used all year long. 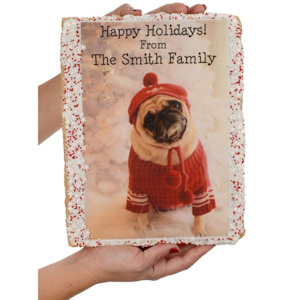 It’s available in two colors (brown or red) and can be personalized at Studio Style . Here’s a truly unusual holiday “card” – or perhaps “holiday greeting” would be more appropriate, as this isn’t really a card in the traditional sense at all. It’s a giant personalized rice krispie treat. Yes, an edible Christmas card! You won’t have to feel guilty about cutting down trees to send this card, and your recipients won’t need to recycle this greeting. They can simply eat it! Don’t like Rice Krispies? Then check out the 2-lb. personalized holiday greeting chocolate bar at Savannah’s Candy Kitchen. musical Christmas cards. It contains assorted designs and songs such as “Rudolph the Red-Nosed Reindeer” by Burl Ives, “Jingle Bell Rock” by Bobby Helms, “Deck the Halls” by Choral Group, “Frosty the Snowman” by Ella Fitzgerald and others. Turn yourself and your family members (even your pets!) into cartoon characters! 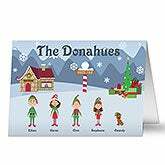 These cool Christmas cards from Personalization Mall feature any greeting with your family name featured across the top of the card, along with everyone’s first name personalized below each character. Choose grandparent, adult, youth, or baby figures, male or female, light or dark complexions, even pets! 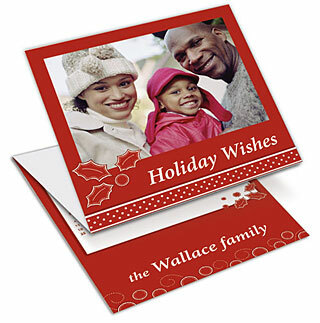 Cards can be personalized with one of 19 different messages or you can select your own Christmas card wording, and the verse and personalization can be printed in your choice of ink colors and font styles. Click an image to get a larger view and see more details. Adapted from Unusual Christmas Cards and Cool Christmas Cards on Squidoo.